Project Gallery: Jonathan Gonzalez (Office GA) | Miami Center for Architecture & Design, Inc. The Miami Center for Architecture & Design is proud to present Tree House [Coat Rack], a site-specific installation by Jonathan Gonzalez of Office GA in the center’s project gallery. 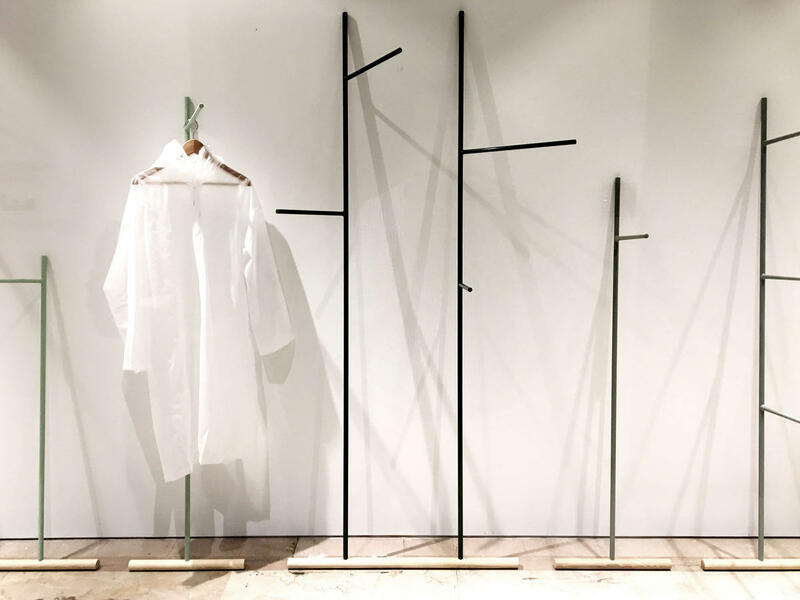 The exhibition at Miami Center for Architecture and Design allows the opportunity to explore and evidence the iterative process of design through a simple industrial design object, the coat rack. Each green leaning rack makes subtle shifts in hue, size and angle. The result of this playful investigation renders a tree like landscape scene inside the Center’s downtown Miami exhibition space. Utilizing the same kit of parts, powder coated solid steel round bar and solid maple bases, each piece affords the user a unique interface to a singular function. Rather than present the coat rack as a free-standing object, they intended to be leaned against a wall, a simple gesture that transforms the object’s relationship to its surroundings. The “branches” of each coat rack interact with the lights around them, resulting in a shadow play that mimics the behavior light has with trees in nature.